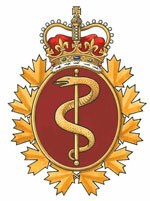 The deep red colour represents blood, and the rod of Aesculapius signifies that this is a medical organization. This Latin phrase means “We hasten to aid the soldiers”. 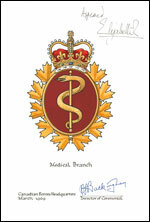 The colours of red and green represent blood and health. 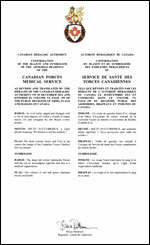 The announcement of the Letters Patent was made on November 30, 2013, in Volume 147, page 2705 of the Canada Gazette. 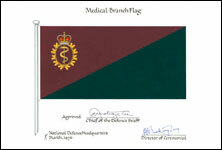 The badge was originally approved in March 1969 and the flag on 8 March 1976.